The Photo Marketing Association (PMA) convention, which is currently underway in Las Vegas, primarily focuses on digital photography and printing. But with HD televisions selling like hot cakes and the tech industry’s focus on bringing digital media into the living room, several companies at the show are offering consumers new ways to produce and view HD content on their new TVs. Both Sony and Samsung are showcasing ways to turn your HD TV into a high-definition photo viewer. Two of Sony’s newest Cyber-shot cameras—the 7-megapixel DSC-W80 ($250) and 8-megapixel $300 DSC-W90 ($300)—can connect to your HD TV via a specially designed cable, which is sold separately, and display photos and slideshows in 1080 HD. Samsung’s HD Photo Box, on the other hand, is a photo storage device with 250GB of internal memory. You can load photos directly from your camera or connect it to your Mac. When the device is plugged into your HD TV, you can use the remote to navigate your photo library or select categories of photos. The HD Photo Box automatically categorizes photos by composition orientation, and even color—after all, you don’t want your photos clashing with your decor. The estimated price is $350. Just about all point-and-shoot digital cameras can shoot video now. But Canon’s compact 7-megapixel PowerShot TX1 does one better—it records 720p widescreen video at 30 frames per second. You can view the video on your HD TV via a component video cable, or download it to your Mac. The TX1 costs $500. Last year, both Sony and Canon released compact HD camcorders targeted at consumers. However, the cameras came with some notable drawbacks. For example, there was no microphone input, which meant you were stuck with the onboard sound. But the latest generation of consumer-level HD camcorders from Canon and Sony appears to fix these omissions. The Canon HV20 ($1,099) includes a microphone jack, HDMI connector, and horizontal design for easier handling. Sony’s HDR-HC7 ($1,400) also offers a microphone port, along with Sony’s x.v.Color feature, which they claim captures nearly twice the number of viewable colors. Another interesting entry on the HD market is JVC’s Everio GZ-HD7 ($1,799), a hard-drive-based camcorder that captures 60GB of full broadcast quality HD video (for roughly five hours of video). 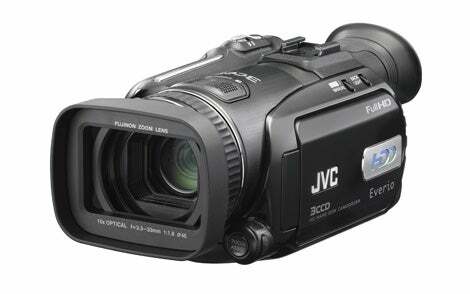 The camcorder, pictured above, features a 3CCD sensor, a microphone port, an HMI port, and a FireWire port. You can import the HD footage into iMovie HD for editing. The Everio GZ-HD7 should be out in April.